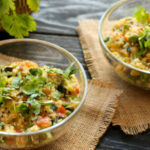 Delicious and Healthy, Jowar upma is a savory breakfast porridge made with whole grain sorghum and seasonal vegetables. This upma is a nourishing start to your day. With sorghum and vegetables, it fills you up with energy and keeps you full for longer. Soak jowar grain in water for at least 30 minutes. In a deep pot, bring 3 cups of water to a boil. Add some salt. Drain and add the soaked whole jowar and to the boiling water. Cover and let it cook on medium heat till the grains are soft. Takes about 10 mins. Jowar grains will soak in most of the water and be a little wet and mushy. You can also cook whole jowar in the rice cooker. On another stove, heat oil in a wok/ kadhai. Once the oil is hot, add mustard seeds, dried red chili, and curry leaves. Sauté for a minute before adding green chili, ginger, and onion. Mix well and cook for a minute. Add the chopped bottle gourd and capsicum. Mix and cook for 5 minutes, until the vegetables start to soften. Add the boiled peas, tomatoes, turmeric and salt. Mix well and cook for a couple of minutes. Add the cooked jowar and lime juice. Mix well and cook for another minute. This recipe for sorghum porridge can be used to make porridge with other whole millets like foxtail millet, proso millet, and other small grain millets.